I’ve been part of the Twitter community now for a few months. It’s an amazing community and I can easily say that, had I known more about it when we were traveling, it would have changed our travels…but more on that another time. 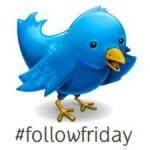 #FollowFriday is a time for us Tweeps (how cute is that?!) to introduce to our Twiends (okay, I just made that one up!) to other Twitteri (nope, that one is real.). Anyway, I thought I would bring it to OneGiantStep so that you, too, could meet the Tweeps I call Twiends in the Twitterverse. I love Matt’s story. He met, and fell in love with, his wife via the internet…and then traveled halfway around the world to meet and marry her! Love Conquers Fear he entitled the post…and I agree! Now they are planning on packing up their lives, and their two children, to return to her homeland for a OneYearSabbatical and, even though he married into the culture and has inside information, he sounds just as tentative and excited as any soon-to-be world traveler. Oh, how I have a soft spot in my heart for Kim! She is me circa Aug2008 when I took my first, tentative steps into blogging and tipped our hand about our grandiose plans. Reading her post announcing their RTW plans made me remember “that heady mix of excitement and anxiety that can see you one minute smiling and laughing like a goon, and the next minute balling your eyes out feeling like your going to puke”. (I quote b/c I made this comment on her post) I am more than excited to watch them step out and see their dream come true!! Check these Tweeps out and I promise, next time, to keep the silly speak to a minimum…tweet, tweet! Oh, and don’t forget to ‘Like’ my new OneGiantStep FaceBook Page!! Hey Gillian! I’m happy to be your Twiend! Happy #FollowFriday. Nice list, other than Matt I didn’t know these people! Gillian!!! Thank you for including me (and Brian) on this list!